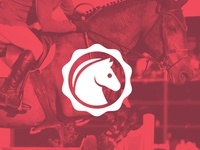 I recently did some logo designs for a client creating a horse app. Here's one of the rejected logos. This one was a little more experimental and modern.